It is no secret that I love the combination of PB and chocolate. To me there is no better combination when it comes to sweet treats. Needless to say, I will use any excuse to make treats involving this delicious combination. This recipe is by far my favorite Peanut Butter cookie recipe ever; and believe me, I have tried many many recipes (Like I said ANY excuse to try more Chocolate/Peanut Butter combinations). The recipe below has been six years in the making. I first received the original recipe as part of a recipe exchange in a club I was involved in my junior year in college (Thanks Heidi). Not being much of a baker back then I liked the recipe but did not know how to tweak it to better meet my preferences (tender and chewy with a lighlty crisp exterior). Don’t get me wrong it was a good cookie to begin with but felt there was potential for more. There were things I LOVED about the original. I have tried many recipes for Peanut Butter cookies since first receiving the original recipe but have always come back to the one from Heidi. One thing I love about this recipe is that there is more than twice as much Peanut Butter than butter. I firmly believe that Peanut Butter should not share the spotlight with butter in ANY cookie that claims to be a Peanut Butter cookie! I also love the addition of chocolate and Peanut Butter chips (genious) and that you roll the dough balls in sugar before baking. This creates a slightly crisp exterior that compliments the delicate texture of the interior perfectly! As my experience in baking grew I began to tweak the origianl recipe each time I made it and I am happy to say I am finished tweaking. It now meets and exceeds my expectations of what a Peanut Butter Cookie should be. I know everyone has a different idea of their “perfect cookie” so these may not be your cup of tea, but I do suggest at least trying them. I make these often and every time I take them somewhere people comment on their wonderful light texture and great Peanut Butter flavor. 1. I like to chill the dough for about 15 minutes before baking and keep it chilled while one pan is baking (especially during the warm months as Peanut Butter tends to ‘melt’ easily and makes the dough harder to work with). Chilling helps the cookies keep their shape while baking and helps with the delicate texture of the baked cookie. 2. You need to let these cool on a baking sheet for at least five to ten minutes after removing from the oven, if not they will fall apart because they are so tender! You can finish cooling on a wire rack before storing. 5. These are delicate cookies and can be difficult to transport. I find a single layer of cookies transports beautifully. If needing to stack cookies to transport, place a few sheets of waxed paper in between layers. Line baking sheets with parchement paper. In a large bowl wisk together the flour, baking powder, and salt. Gently add to creamed mixture and mix until almost combined. Fold in chocolate and peanut butter chips. Chill dough for at least 15 minutes. Roll tablespoonfuls of dough into balls. Genlty roll the dough balls into sugar and place dough balls on parchment lined baking sheets. Carefully press each ball with fork tines to create a criss-cross pattern. Bake for 8 to 10 minutes in the preheated oven, or until edges are lightly browned. Remove from oven and cool on baking sheets for 5-10 minutes until sturdy enough to be transfered to a wire rack to cool completely. This entry was posted in Chocolate Chip Cookies, Cookies, peanut butter, Rated a 9 by bakingblonde. Bookmark the permalink. Those look stinkin’ good! I’m still trying to find a perfect pb cookie recipe and will try this next. Love how great even the balls of dough look! Love your blog and the things you make! These look wonderful! My dad loves peanut butter cookies, so I want to find the perfect one to be able to make for him. I’ll definitely give these a try! Those do look perfect! I will be making these soon! I’ll have to try these. Peanut butter cookies sound really good right now. They do look the best! No lie…my mouth is watering just looking at the pictures. These sound fabulous! We have so much xtra pb, this is DEFINTELY on my list to make soon. YUM!!!! oh gosh, I could seriously eat your picture…. I’d eat the one of the dough first though! I’m thinking these are perfect for the beach for July 4th weekend. I made the cookies and posted about them on my blog. They were GREAT! I’ve made them twice and this second time I made 72 small cookies–perfect for a baby shower I’m hosting on Saturday. They are yummy! Thanks for the recipe. Okay, I’ve made them. They’re good, but I left out the chips and think they need the chips. I still have some dough and plan on adding the chips to it……that is, when I get some! Yeah, the chips really take them to that next level and elevate them to PB Royalty in my book! Get some chips, you will thank me later (if you mouth is not full of cookie) ha ha. Oh my god! MY VERY FAVORITE COOKIE EVER!!!!!!!!!! Please could I have one with a glass of icey cold milk!!!!! Sorry it’s taken me so long to comment again, but I added peanut butter chips (a bunch! didn’t measure) to the remaining dough. Chips are definitely necessary. Not that the cookies aren’t good by themselves, but the chips matched the level of sweetness in the cookie and made them over-the-top good. So yes, Peanut Butter Royalty! Of course you can double the recipe, just make sure your mixer is large enough to handle it! Also, don’t over mix once you add the flour or they can turn out tough. SO glad you enjoyed them! The chips are integral to pushing these babies over the top good!! These, I will try. Well, once I get some decent baking weather. I made some chocolate oatmeal chocolate chip cookies a while ago and between the 3rd flr apartment, 85 degree humid heat and 350 degree oven it was pretty brutal. But my girlfriend loves peanut butter cookies and the recipe I already have is adequate, but not stellar. Do you ever use chunky peanut butter? I made these the other day and they went over very, very well! Thanks for the fantabulous recipe!! These were soooo delicious. I made them once as you call for, then the second time I used Almond butter in place of peanut. Also, I threw 1 cup of chopped raw almonds into the mix. No joke–the cookies tasted like chocolate covered almond clusters–delicious! Hmmmm, your recipe looks delicious. And I’m sure they are the best ever. (sly grin) But I want you to do me a favor if you want. Try MY recipe, just once, and tell me what you think. I know, I know, it’s only FOUR ingredients, how it could it possibly be any good. p.s. I’ve never made my recipe and added chocolate chips. You might wanna try that. I have tried the recipe you linked back to and liked them very much (before I began blogging). I have even made them substituting Brown sugar for some or all of the white sugar called for. They are very very yummy, I will give you that! I tried these and thought they were great!!! My daughter (age 17) also loved them and she doesn’t really like peanut butter. I love your website!! I am anxious to try the 10 best recipes for the new year. I really love peanut butter cookies! I will have to give these a try! My favorite too! Love peanut butter and chocolate, and need to try this one! WOW! These cookies are as amazing as you say – I can definitely tell you spent years perfecting these! … I made them this morning for a pb-loving friend’s birthday – he hasn’t tried them yet, but they’ve made a convert out of me! Wow! You are not joking! These are the best beanut butter cookies, period! I just realized, as I came on here to post this, that I forgot to roll them in sugar. Oops! I will need to make sure to do that next time, and oh yeah, there’ll be a next time! Thanks for sharing the recipe!!! BEST RECIPIE KNOWN TO MAN. bakingblonde–do you use creamy or chunky peanut butter? also, all-natural or the kind with ingredients other than peanuts? I use creamy peanut butter but that is just my taste preference, feel free to use chunky if that is your thing. I do not use all natural and tend to like Peter Pan peanut butter but have made these using everything from Jif to Skippy and have never had a problem or complaints. These turned out wonderful. I’m not even that fond of peanut butter cookies. But I was a HUGE fan of these. Fantastic! Have to admit, I was highly skeptical…even after 45 min. in the fridge, the dough was extremely soft. With visions of the cookies spreading I put them in the oven anyway. Much to my surprise, they stayed true to shape. I am a convert! Thanks for a great new addition to my cookie rotation! I made these yesterday… absolutely amazing! The only thing I didn’t like was having to wait for them to cool long enough to try. Yesterday these were really good… and I didn’t think it possible, but today they’re even better. Thank you so much for sharing this recipe!!! do you use salted or unsalted butter in your Peanut Butter Cookies? I always use salted butter, and I really like the Peter Pan brand peanut butter, If your brand tends to be more salty, I would use unsalted butter or adjust the amount of salt you add to the recipe. Thank you so much! I made these cookies this weekend and received many compliments and recipe requests. I also made your Toffee White Chocolate Pecan cookies and they were a hit also. I was skeptical at first because the dough was so thick but they turned out amazing! Probably my favorite cookie recipe so far! Thanks again!! Love your site! Question about the recipe, though. 1- Do you use whole milk? If so, do you think using 2% would make much of a difference? 2- Do you use the standard semi-sweet chocolate chips? It seems to me that peanut butter might pair better with milk chocolate. Have you tried it with those? Thanks! Nope, I usually use 1 or 2% because that is what we have in the house. I LOVE using milk chocolate chips in PB cookies, the best combo in my opinion! 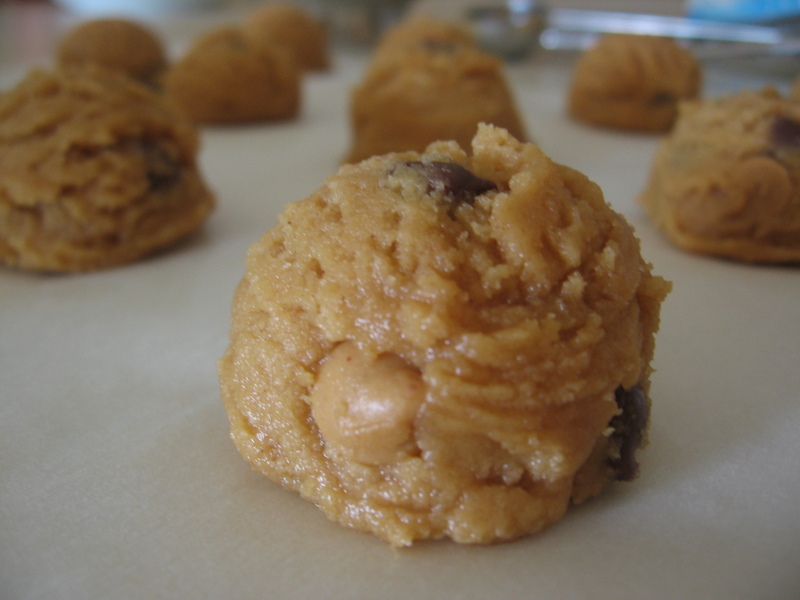 Just made these… used double peanut butter chips and didn’t add chocolate chips…AMAZING!!! I dont know how I wont eat them all before my husband gets home from work! Could this recipe be formatted to forward to an e-mail address? I made these cookies for several events and my family. They were a great hit! Of course I put in extra vanilla and also I sent my friend down to the store to pick up the peanut butter chips and he came back with Reese’s Pieces instead and they were very, very good in these truly wonderful cookies. I am going to try to make them with the pb chips and see which one is better but my guess is the pieces! They were also very colorful and I put one on the top of each cookie in the middle. The kids loved them too and picked out the color they liked of the one in the middle. The pieces made them quite fun. My search for the best PB cookies is definitely over, these were awesome! Love the combo of pb and chocolate and how light and delicate they are. These cookies didn’t last long at my house 🙂 Thanks for the great recipe! These were beyond EXCELLENT. I have tried MANY choc. PB cookie recipes- this is the best- THANKS!!! Thank you so much for this recipe! It is FANTASTIC, delicious, amazing 🙂 Mmm mmm mmm. They are the best aren’t they? Love them! I made the cookies but they were not great, a bit cakey. I like my cookies gooey in the middle and crispy on the outside. What did I do wrong? I halved the mixture so maybe there was too much egg (didn’t halve the egg). And I just put them on a greased tray, no paper. Does that have an effect? Hanna the extra egg can affect the final product especially when halving a recipe. It may also be a bit more flour was used than was needed. Hope you find a cookie that meets your preferences, a gooey cookie is never bad! Wow… I am tempting after seeing the baking cookies. I like lot baking cookies. Thanks for good information. I just made these and they are truly excellent. I left out the choco chips and doubled the pnut butter chips, as well as added some rough chopped lightly salted peanuts (about a cup). Fantastical yummy-liciousness. Trust me. o.k Baking Blond.. I have just made this recipe… I had no chips of any kind so I made them without. ….My family says…Best Ever…OMG!! warm from the oven, yum. so if you are contemplating this recipe..go for it!! thanks Heidi and Baking Blond. I can’t wait to try your PB cookie recipe for a girls weekend in November!! Can you tell me how long the cookies will stay fresh if they are stored in a container with a piece of bread (which you suggested)? Does a plastic or glass container work better, need a fresh piece of bread each day? Thank you. I like to keep them in a tupperware or a container with a sealable lid. Make sure the bread is not touching the cookies (it can be a half piece). They should stay good for 2-3 days like that but i have frozen some for weeks and then just allowed to come to room temp on a plate before eating with great results! HEY UMMM WE ARE MAKING THESE COOKIES AT HOME ON A SNOWY DAY NO WAY TO GET TO THE STORE IS NO CHIPS [ CHOCALATE AND PEANUT BUTTER ] OK? I made these last night and I would so give them a 10 out of 10. I am eating 2 right now with my coffee for breakfast (diet??). I don’ t even like peanut butter cookies but my son does. They are so soft and mine didn’t crumble at all, I left them in the fridge for 3 hours because I forgot I had to run an errand. You really have to time the cook time like you said or they will over cook. YUMMMY Is all I have to say. Plus it was a pretty easy recipe to make. So glad you enjoyed the recipe, they are my favorite as well! The other recipe is a bit more crisp but not crunchy. I like them for a change of pace especially since they are the only cookies my Taste Tester makes! Finally got around to making these, veryyyy yummy!! But not the best I’ve ever had, how could I make the cookies more chewy? Thank you! to make more chewy you can reduce the baking time a bit and add sub brown sugar for all of the white sugar. You could also add a tad more milk, be careful not to add too much though as the dough will not hold its shape well when baking. Thank you sooo much!!! I will try that and get back to you about it. I have a serious obsession with peanut butter haha does the type of pb effect it? i used skippy last time, what if i used natural peanut butter? the type of peanutbutter can really affect the final cookie. I don’t use natural in my recipes unless I have played around with the recipe a lot to account for that. I like Peter Pan peanut butter and rarely use the ‘low fat’ in my baking. Hands down, the best peanut butter cookie I’ve ever had. They turned out perfectly. Thank you. Linda, I have too many recipes I love to name, since I rate my cookies, I would check out the 9 and 10’s and go from there. I have several I haven’t had time to blog about yet but I will soon! Happy HOlidays! I usually get between 2 and 2 1/2 dozen but it really depends on the size of your cookies. I have never doubled the recipe but i don’t seen any reason why it would not work out since the measurements are pretty standard. Hi! Do you think these would be ok to cook in a mini muffin pan and put a Reese’s cup in the middle ?! Thanks! I have never tried it but i bet they would be! These are not a super sturdy cookie so they may crumble more than another peanut butter recipe. Wow!! Hands down the best peanut butter cookies ever! Left out the chocolate chips and doubled up on the reeses and mmmm! Had to cook for an extra minute or two but they turned out awesome! I tried these with just the peanut butter chips and they were amazing! Curious if you take the chips out, if they would make a good peanut butter blossom cookie as well? I mean it is just a peanut butter cookie with a hershey kiss on top right? My husband is a huge PB cookie fan. It’s about the only sweets he will eat, so I am always looking for a great recipe. This one is FANTASTIC! I omitted the chips *(his preference) and they were still awesome. They came out soft and chewy and had a strong PB flavor. This is my new go-to favorite recipe for Peanut Butter Cookies! Thanks!!! I make these all the time. Hands down the best peanut buttery cookies ever. I don’t use the reeses chips cuz the ingredients are crap. i do use chocolate, usually some variety of ghiradelli chips. milk chocolate are nice. i also use dark brown sugar instead of regular. makes them a little darker but i like the flavor and texture better. thanks for a wonderful recipe. Found this recipe the other day….these are the best cookies I have ever made lol!!!!! Thank you for an awesome recipe!!!! 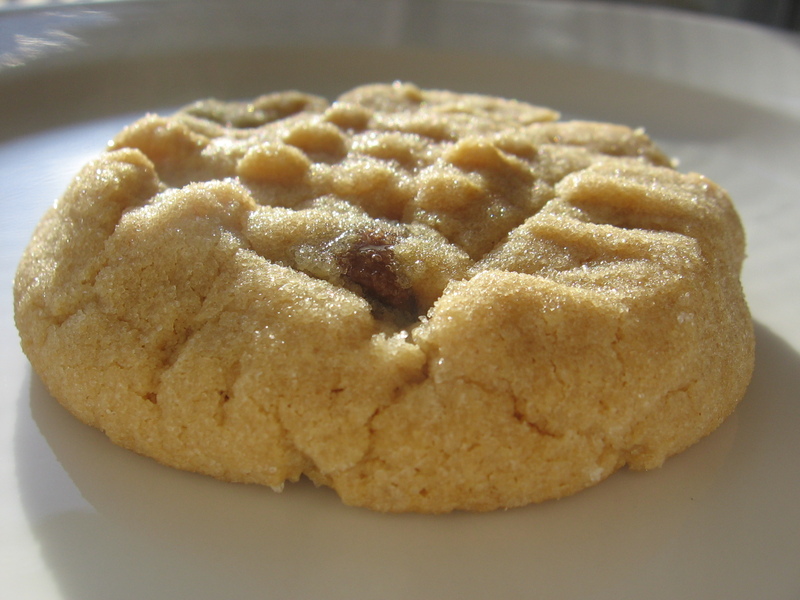 For anyone wanting an awesome peanut butter cookie recipe…search no more!! so glad you liked them, these are a family fave! Your recipe looks wonderful! My daughter does not like chocolate. If I left out the chocolate chips, would I need to substitute with anything else? I didn’t want to mess up the consistency of the cookie. You would not need to substitute anything else, but if you wanted you could add more Peanut Butter chips or Reese’s pieces to jazz them up a bit, but they are good either way! Can you use this recipe for peanut butter blossoms (just with the hershey kisses on top)? Sure can! They are a bit more fragile than a regular PB cookie though so handle with care. These really are the BEST peanut butter cookies!! I made them tonight and my husband and I just love them!! I actually made them for my brother, but I don’t know if they’ll make it in our house until I see him again. Thanks for a truly delicious recipe!!! These are absolutely the best peanut butter cookies I have ever had. I have made them twice, and they disappear quickly. Thank you so much for sharing your recipe.